One of the things that made Google Chrome popular, both on desktops and Android was its simplicity. Chrome for desktops had a minimal design that hid many of the features inside a menu instead of the browser interface. Things like bookmarks and history all took a backseat. That’s something Chrome brought to Android as well. 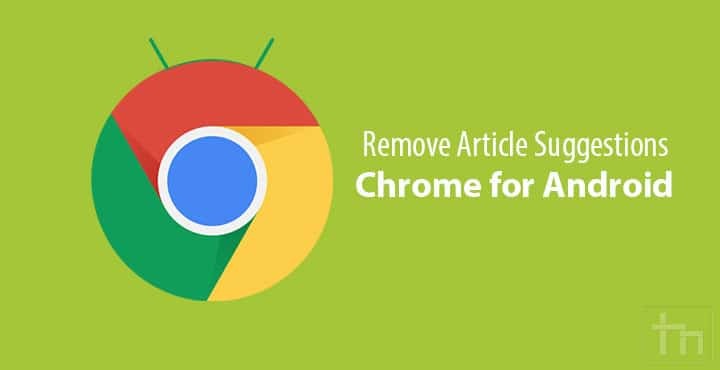 Where other browsers were packed full of news and bookmarks and what not on the main page, Chrome simply had the Google search bar and your most visited websites. Newer versions of Chrome though have ditched that minimalism in favor of article suggestions. Most of these articles are simply the articles already suggested by the Google app or the Google Now pane on your launcher if it has one. Google Now is already not as useful anymore as it was, having stuffed away all important things in the Google app instead of where they should be. Chrome too now just feels bloated and not simplistic. It isn’t close to as horrible as some of the other browsers out there trying to sell ads, you see. Yet, it isn’t even the simple browser that gets out of your way that it used to be. It makes sense if you want to get rid of it especially if you’re already using Google now. If you’d like a distraction-free browsing experience without switching your browser, you can turn on or off some flags. 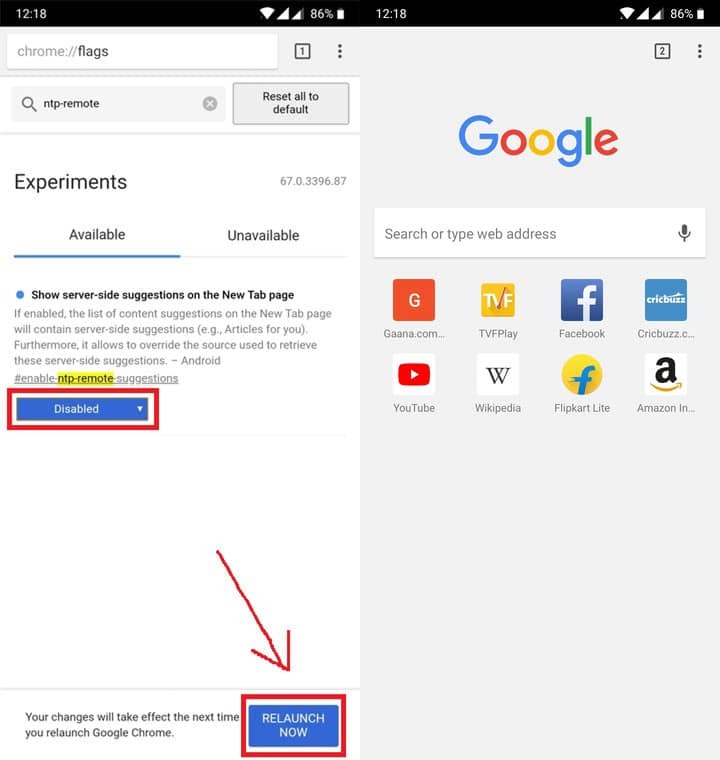 Chrome flags are hidden settings in the Chrome browser that make it easy for developers or early adopters to test certain features. Keeping these settings hidden makes sure that the end user doesn’t end up turning any of it on by mistake. 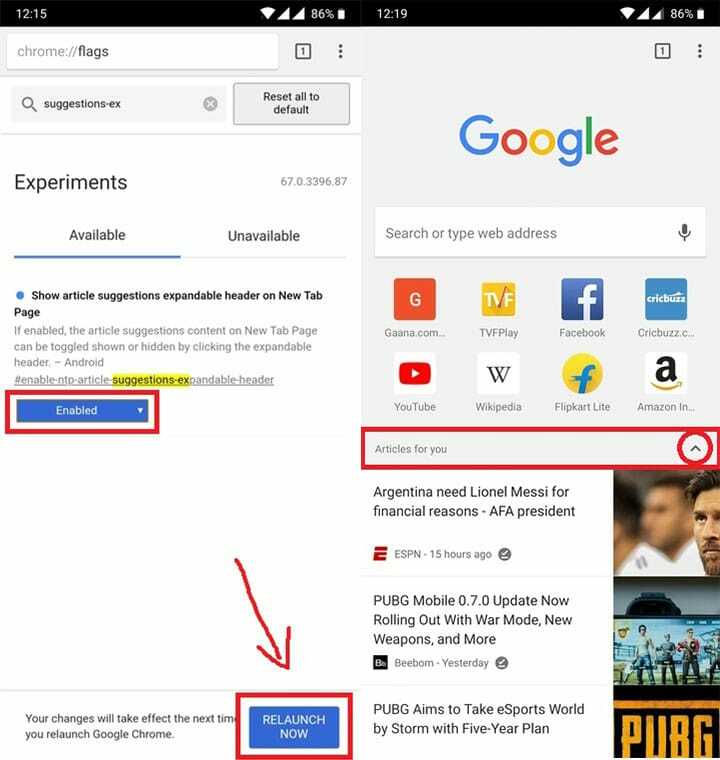 Google considers these features experimental but most of them are quite safe. Using the flags, you can either hide the article suggestions behind an expandable header or get rid of them altogether. If you want to learn some more things you can do with Chrome flags, visit this link. This is a slightly moderate approach wherein the article suggestions are still there when and if you want them. However, instead of being front and center and cluttering up the new tab page, they can be collapsed behind an expandable header. Launch Google Chrome on your Android device and go to this URL: chrome://flags/#enable-ntp-article-suggestions-expandable-header. You can type it out or just copy and paste the URL into the URL bar. Alternatively, you can simply head over to chrome://flags instead and search for expandable. This is the only Chrome flag that has the keyword expandable in it, for now. For a more precise search, you can type ntp-article-suggestions in the search bar. Under the Show article suggestions expander header on New Tab page heading, click on the drop-down menu and select Enable. A button appears on the bottom asking you to RELAUNCH NOW. Tap on it to relaunch the browser. When the browser opens up again, head to a new tab page and you’ll notice a small arrow on the right of the Articles for you header. Tap on it to collapse or expand the section. If you’re sure you never want to see the suggested articles you can just outright remove them instead of hiding them. For this, you’ll need to disable a flag instead. The flag that controls displaying of the suggested articles is Show server-side suggestions on the New Tab page. Launch Chrome on your Android device and head over to this URL by copying and pasting it or typing it out yourself: chrome://flags/#enable-ntp-remote-suggestions. As before, you can instead go to chrome://flags and search for ntp-remote-suggestions instead. Tap on the drop-down menu under Show server-side suggestions on the New Tab page and select Disable. Tap on the RELAUNCH NOW button that appears when you change the flag and Chrome will restart. When you head to a New tab page now you’ll find it squeaky clean with only the omnipresent Google search bar and favicons of your most visited websites.